Words Out Loud looks up for inspiration in May, whether to the heavens or simply the fairy light-festooned ceiling of the Printers Room. It might be that the dinner special of hearty stews and damper, and perhaps a few other bush treats, had an influence too, in setting the theme to “under the Milky Way”. No need to pitch a tent or stoke the camp fire, though: pitch a piece of prose, poetry or yarn of up to five minutes, and stoke the creative juices instead! Theme’s not your thing? No worries — it isn’t compulsory. And non-performers are very welcome to join us to simply enjoy the night’s offering of spoken word. 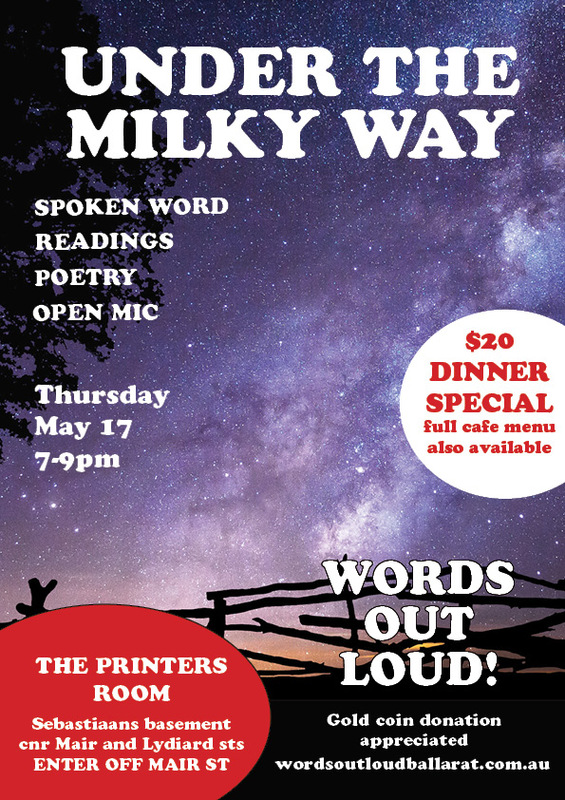 The May edition runs 7-9pm on Thursday May 17 at the Printers Room, in the basement of Sebaastians at the corner of Mair and Lydiard streets. The dinner special is $20, and the full menu is also available, along with a well-stocked bar. The spoken word event encourages poets, writers and raconteurs to share their work, or favourite pieces by others, for five-minute open mic sessions on the third Thursday of each month (unless otherwise advertised). Enter via Mair St. Drink and food available before and during. Take in the air in the beer garden. Enjoy the show from couches, the tables or a seat by the bar. Gold coin donation appreciated.